Karaoke Air App. Select Song from HDD & Youtube Karaoke by Iphone, Ipad, Android, Tablet. Design in Japan, Newest Model: 2019 SINGTRONIC KA-4500DSP's hottest product from Singtronic, the world's first karaoke mixing amplifier with a built-in Digital Console Processor of 2000W + 2000W hard hitting power. Equipped with a BBE processor and DCP (Digital Console Processor) creates music & vocals come out with rich details heard in concerts. 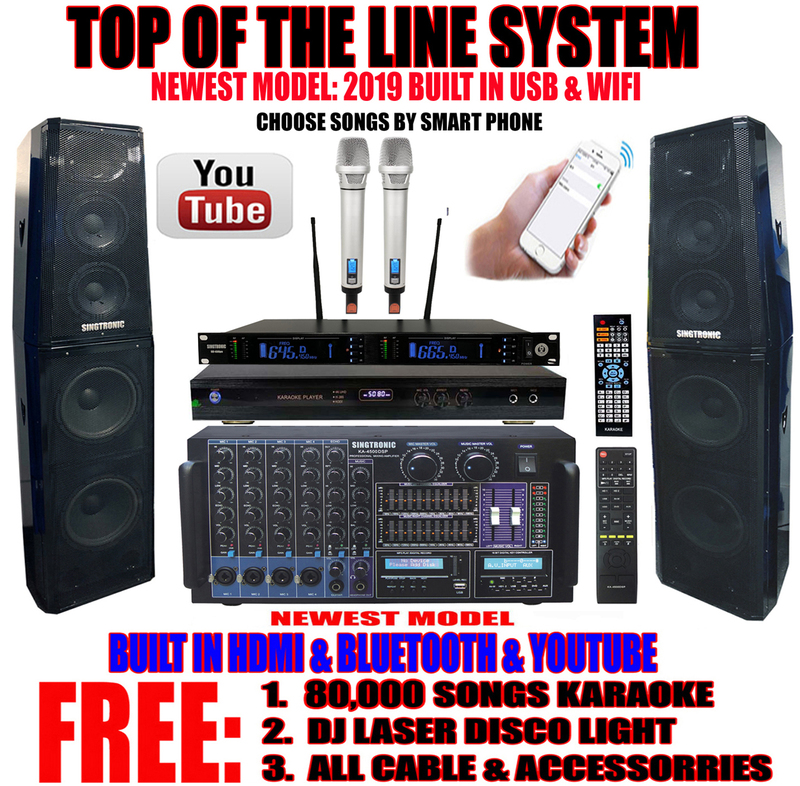 The newest 2019 feature added is the HDMI Direct, Bluetooth Function and 10 band equalizer which allows you to professionally fine tune your speakers. The Singtronic KA-4500DSP also includes a USB slot Recording allowing you to sing & Recording your voice at the same time. The Singtronic Professional Rack-mountable KA-4500DSP Professional 1500-Watt Mixing Amplifier is designed with KJs and serious karaoke singers in mind. It's patented design will forever change how you will be using your karaoke mixing amplifiers in the future. Newest 2019's Bluetooth Function. Forgot your USB flash drive at home? Want to play audio files from your phone while keeping it safe in your pocket? No problem. The KA-4500DSP Bluetooth compatibility allows for wireless connection to any A2DP stereo Bluetooth device. That means you can play audio files from your phone, laptop or any other Bluetooth enabled device within a 30 foot foot range. The KA-4500DSP gives you the freedom to stream music wirelessly from any Bluetooth enabled device. There are also a wide set of controls to help show off your mixing and production skills, such as the Bass, Mid and Treble. These inputs also display Track Title, Number and Elapsed Time to help you stay organized as you navigate through tracks. Design in Japan, Newest Model: 2019 SINGTRONIC KS-4000DW, the best known name in professional karaoke around the world with unprecedented super tweeters sound quality and power woofer. The exceptional quality and smoothness of sound over the entire audible range ensure unprecedented excitement. Once you have sung with these speakers, you will never be satisfied with anything less. The clubs and bars that use these speakers will enjoy an excellent reputation among their customers. We have every confidence in the outstanding sound quality of these speakers. These 100% Japan crafted speakers are built with quality materials and a higher sensitivity, providing maximum vocal sound per watt. They are also designed with super tweeters and monster woofer, which is perfect for live entertainment and Karaoke vocals. Each KS-4000DW speaker is protected by heavy duty polish piano wood. Design in Japan, Newest Model: 2019 SINGTRONIC UHF-4500 Due to popularity and your demands, Singtronic has released the UHF-4500. Singtronic has taken the world's first UHF Diversity 1200-Channels microphone and enhanced it with all while keeping it rack-mountable with auto-channel-scan and infrared-channel-sync functions. This UHF-4500 professional wireless microphone system combines many features that surpasses most of the professional microphones in the market, we even put an 'X' and called it the 'eXtreme Edition' because it pushes the microphone functionalities to the limit and set a new standard for future microphone designs. This microphone is guaranteed to be the "Top of the Line" microphone you can find in the market with beautiful Pearl Silver Handheld Design. USB Wifi Function Newest 2019: It seems very interesting to choose a song via a Cell Phone or Tabet PC. YES, you can choose a song without a songbook, you don't need to strenuously searching your favorite songs one by one by gluing your eyes to flip pages by pages, or you don't need to operate the menu to avoid interrupting others. Indeed, you can select your favorite songs by Cell Phone or Tablet PC by connect to the KARAOKE machine via wireless USB Wifi network, then you can choose your favorite songs on your Cell Phone. The process is easy to operate and avoids wasting time to locate your favorite songs. Of course, FREE: USB WIFI Dongle are provided for choosing songs via a iPhone / Android Phone or Tablet PC.